This line perfectly describes the devastating loneliness that reverberates throughout Sam Shephard’s Buried Child, currently playing at Writers Theatre. The large house is empty at top of show except for the elderly Dodge (Larry Yando) who is coughing and watching TV all alone as rain falls outside. Dodge looks up at the roof to listen to the rain, which is wonderful because there is no roof in the living room of Jack Magaw’s set. In fact, the entire front of the home is excavated like an ancient archaeological site, preserved so we can see the relics inside. Adding to this jagged, exposed feeling is a massive crack that runs through the middle of the floor. Largely ignored by the family that resides in the house, I could not help but notice that the two outsiders in the play either noticed or tripped over the crack. Shepard’s play follows a broken family in what we’d think of now as a forgotten and isolated America. In today’s world with so many studies about the mind of the voter in Middle America, it feels like this play could have been written a year ago. This script has hardly aged a day, which means we should have seen the fissures in the American fabric decades ago. The first act is stylistically gorgeous with beautiful rainy day lighting provided by Heather Gilbert. The lights in this show are often understated, but Gilbert’s slow fades and shadow play add to the poeticism of the piece. Buried Child begins with comedic rapport between Dodge and his wife Halie, played by the magnificent diva Shannon Cochran. Yando’s Dodge holds the stage for much of the beginning of the play, bickering with Halie while she dresses upstairs. It is difficult for an actor to capture illness in a way that is dynamic, but Yando’s use of stillness fills each movement with significance. When Halie finally makes her entrance, it is a slow and delicious moment that is beautifully directed by Kimberly Senior. First, we just see her feet, then her calves, then the bottom of a beautiful dress, and finally everything from the shoulders down as she pulls on an elegant glove. It is apparent she and Dodge are on different pages. There is an electricity and an elevation to Cochrans’ performance that leaves the audience wondering whether we can believe anything she says, which becomes relevant later in the play. The engine of the play for this critic was in Act II when Vince (Shane Kenyon) brings home his giggly girlfriend Shelly (Arti Ishak), both rocking a cool ‘70s aesthetic complete with rose colored glasses. A big nod to costume designer Mieka van der Ploeg here, their costuming of bright colors, rabbit fur coats and bell bottoms sets them apart from the near graveyard that is Dodge’s house. Vince remembers a home that isn’t there anymore, and violently tries to make the nostalgia he recalls a reality in the present. Without giving too much away, Kenyon is a tour de force in the role, delivering a performance that evokes the Greek tragedies – he expresses an unimaginable torment that is rooted in humanity. Arti Ishak is his match and more in Shelly. As a critic of color, watching Ishak unknowingly walk into this incredibly white, incredibly isolated home in the middle of nowhere instantly gave me anxiety. Dodge rightfully identifies Shelly as a pistol, and boy does she live up to that description. She uses every tool available to her to survive what is an insanely uncomfortable situation, including her wits, her beauty, and just straight up personal strength. Ishak’s Shelly demands to be seen, she screams, she breaks things, and she has a faceoff with Shannon Cochran’s Halie that is just tremendous to watch. It is a rare gift to see two women who are so powerful and at such different places in their careers have a scene with such heart and dramatic tension. It would be a crime to not mention the other portrayals in this ensemble, because it truly took a village to build the world of this play. Mark L. Montgomery is the skittish, sometimes terrifying Tilden is responsible for some of the most visually beautiful moments of the play. He gives Tilden a weight and a deliberate nature that makes you wonder if he is as off as he seems. Bradley (Timothy Edward Kane), the brother with the prosthetic leg, accomplishes physical work that is simple in concept and flawless in its execution. An impressive use of misdirection and just downright strength and flexibility make his portrayal very compelling. Chicago treasure Allen Gilmore plays Father Dewis, the charming Reverend with questionable morals who has the misfortune of wandering into this dank and lonely home. Somehow Gilmore’s charm prevents the Reverend from being solely a salacious man, and you feel empathy for the man whose faith has failed him in a difficult moment. 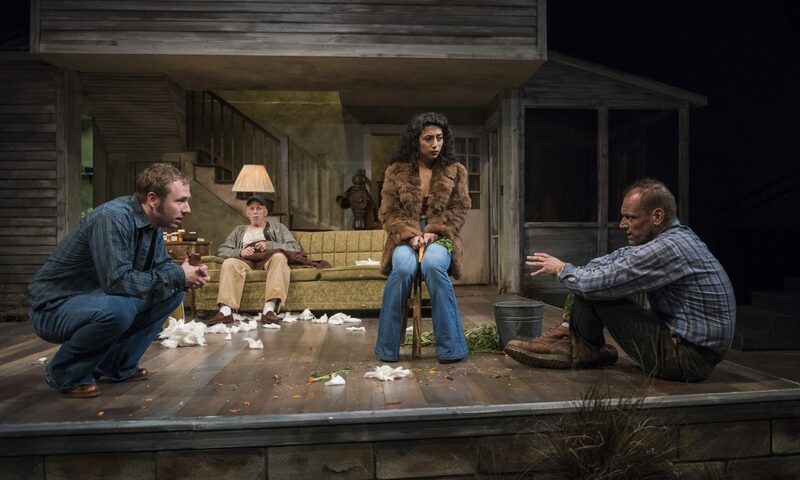 Kimberly Senior’s production of Buried Child is unique in that it cast color consciously without forgetting the monolithic whiteness to which its narrative is tied. I don’t know that I would need to see another production of Buried Child in the future. In this production, the exploration of how damaging the nostalgia of Middle America can be to the rest of the country in this revival is poignant and worth watching. BIAS ALERT: Regina Victor worked as a dramaturg on A Moon for The Misbegotten earlier this year, and has a deep love of three act plays. Dodge, Father Dewis – Larry Neumann Jr.